SOLD! Thanks Rob & Leslie. 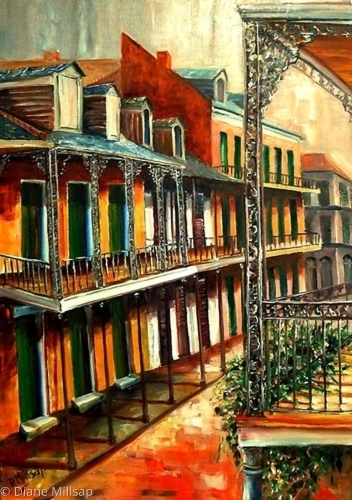 The beauty of Royal Street with its iron balconies and colorful buildings is unmatched! Large original oil on gallery wrapped canvas. Contact me for details. 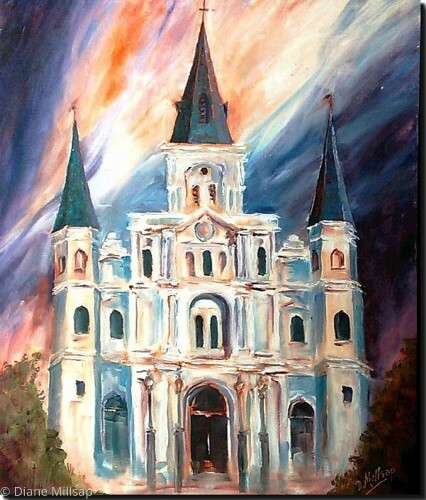 SOLD: Late at night in Jackson Square, one can feel the beauty and mystical presence of this old cathedral. Painted on a gallery wrapped canvas- ready to hang. Please contact me for price. 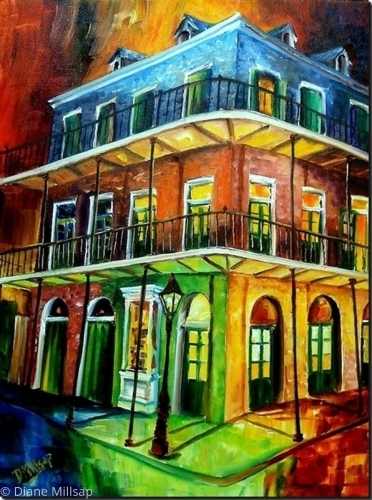 SOLD: Light and colors glow in the Quarter, even at night. There is a feeling of enchantment. Original oil, painted on a gallery wrapped canvas, ready to hang. Jackson Square in New Orleans takes on a quiet glow in the evening. This impressionistic oil painting captures the atmosphere of this historic location. 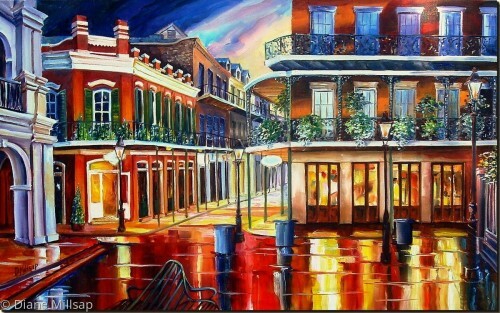 COMMISSION, SOLD: This corner in the French Quarter has a special significance for a couple who live in New Orleans. Please contact me if you have questions about commissioning an original. Tucked away from all the activity of the shops on Royal Street, is this cool quiet courtyard. 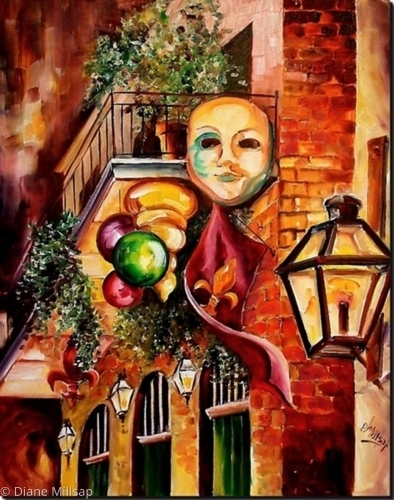 This original oil was inspired by an archival photograph from the New Orleans Historic Collection. 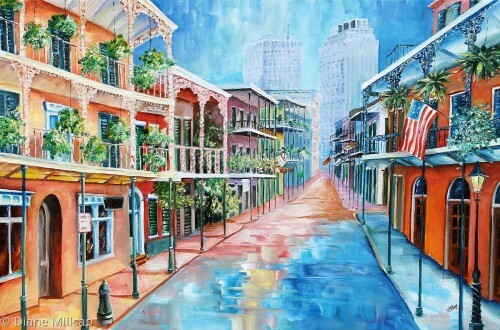 Sample of a commission: A soft and dreamy view of Royal Street. From the buyer: " We are so thrilled with the final product! It is so beautiful and even more than we expected! 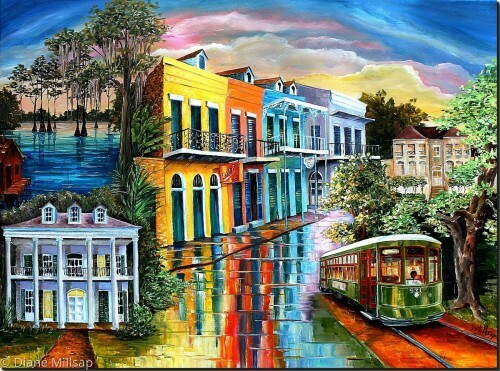 It perfectly captures our love and memories of New Orleans." Contact me for questions about special orders. 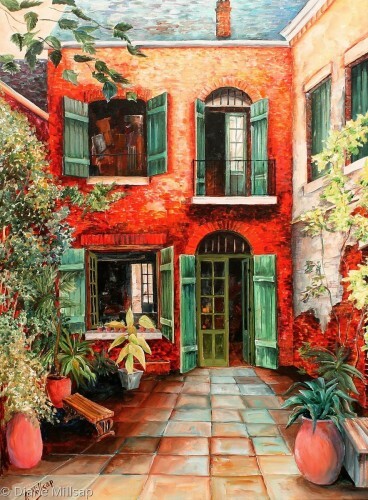 SOLD: Tucked behind the historic building called the Cabildo, is a beautiful little alley where you can imagine what the French Quarter was like centuries ago. SAMPLE OF A COMMISSIONED PIECE. 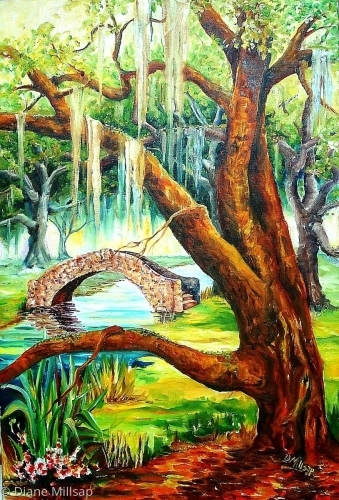 This original oil painting of a live oak tree in New Orleans' City Park holds special meaning to the clients. It is the tree under which they were married. 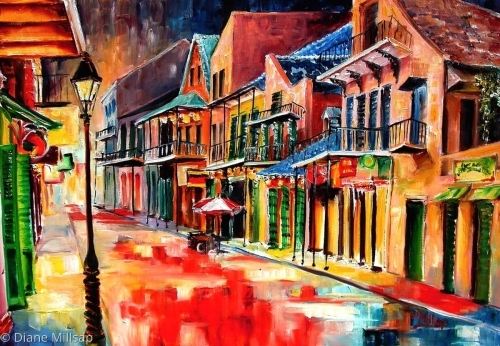 The color, the mystery, and the excitement of a French Quarter night are captured in this vibrant original oil painting. It is painted in a modern Impressionist style with Diane's signature bold strokes of color. 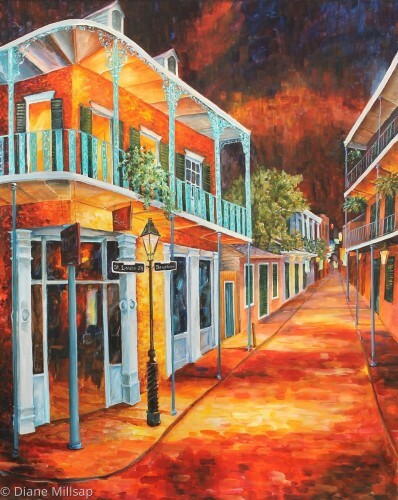 This painting is the perfect accent piece for lovers of New Orleans. It is ready to hang. 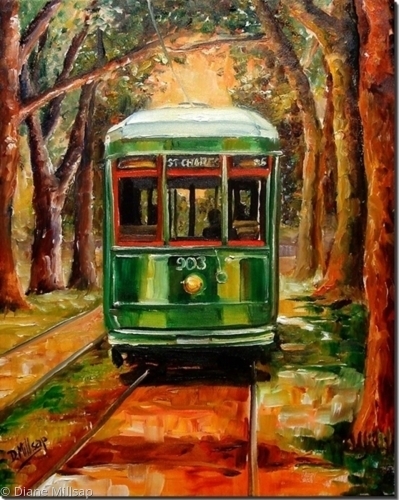 New Orleans famous Streetcar makes its way down the tree lined St. Charles Avenue in this vibrant original oil. It is painted in a classic Impressionist style in glowing colors. It may be hung framed or unframed. The edges of the 1 1/2" deep gallery wrapped canvas are also painted. 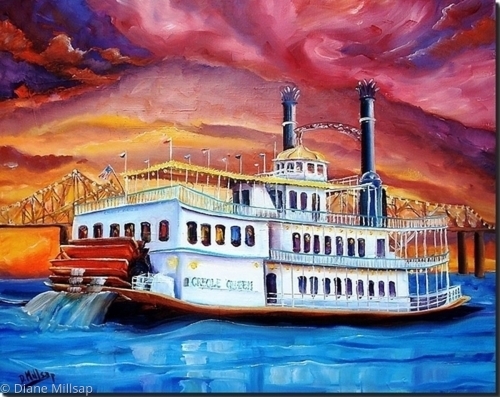 COMMISSIONED FOR A WEDDING GIFT - New Orleans' well known stern-wheeler cruises on the Mississippi against a brilliant sunset in this vibrant original oil painting. Example of a special ordered painting. 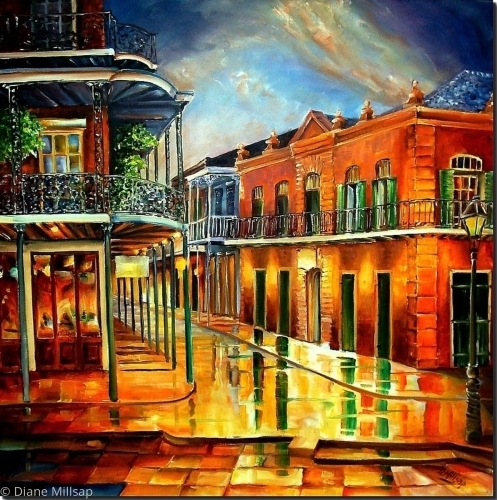 This four paneled oil painting was commissioned by hopspital offices in New Orleans. Please contact me for information on commissioning original art. Shimmering Mardi Gras decorations glow in the night as they cascade from a French Quarter balcony. Painted in Diane's modern impressionist style, this original oil captures the atmosphere of New Orleans' celebrated event. It may be hung unframed, if desired. The edes of the 1 1/2" deep gallery wrapped canvas are also painted, and a picture wire kit is included. 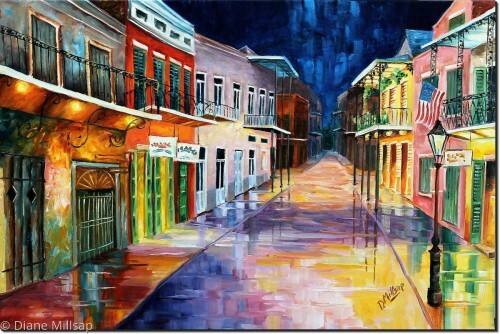 SOLD: Images of New Orleans and the Louisiana Bayou flow together is this large, vibrant original. 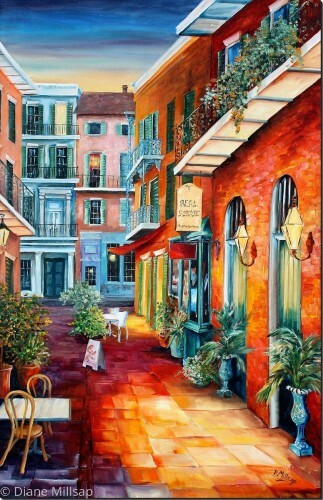 This vibrant original oil painting captures all the light and color of St. Peter Street in the French Quarter. 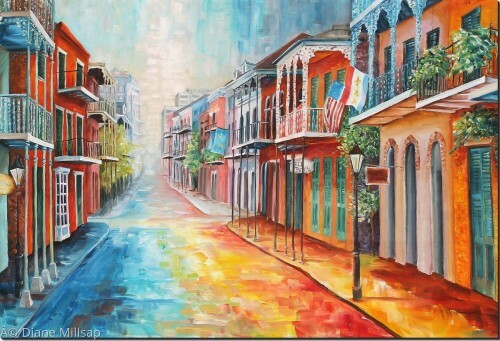 Painted with expressive bold brush strokes in an abstract style, this piece brings New Orleans to life. Homes in the French Quarter are today as they were centuries ago, dripping with fancy iron balconies, painted in bright pastels, and tilting their shuttered dormers towards the sky. This large original oil is ready to hang. The edges of the gallery wrapped canvas are also painted, and a picture wire kit is included. 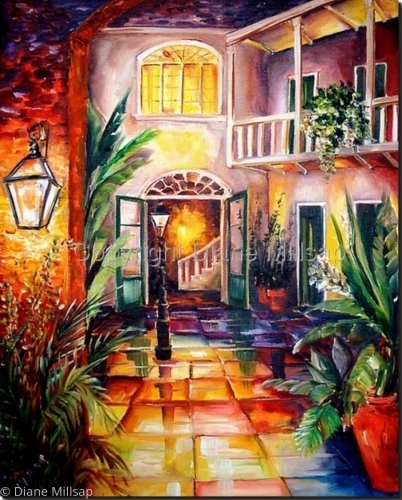 SOLD - As evening approaches, the lamps are lit, and a courtyard in New Orleans takes on a magical glow. This large original oil is painted in a classic impressionist style with rich, vibrant color. It may be hung unframed if desired. The edges of the 1 1/2" gallery wrapped canvas are also painted, and a picture wire kit is included. 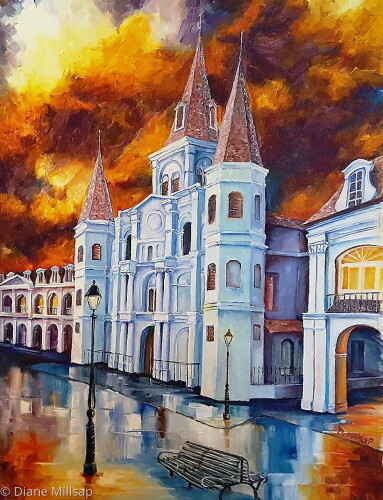 SOLD - The timeless beauty of New Orleans' St. Louis Cathedral is captured in this small, but vibrant, original oil on canvas. Sweeping brush strokes and vibrant color create a misty view of this famous landmark. 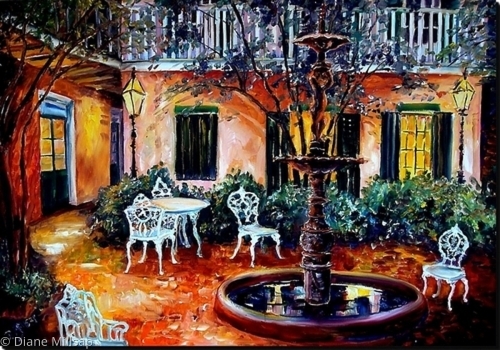 SOLD - This very large original oil captures captures a beautiful, quiet moment in the heart of the French Quarter. It is painted on a gallery wrapped canvas and is ready to hang.